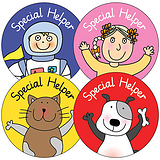 A sheet of 35 Pedagogs Special Helper stickers in a variety of colours on the same sheet. Each sticker is 37mm diameter. We have encorporated a mixture of characters which appeal to all your learners. All your Special Helpers can have a reward they will love. 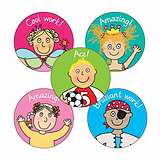 These stickers are ideal for easily rewarding your 'special helpers'. 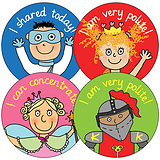 Can be used on reward charts, books, bookmarks and jumpers.